Escape the daily grind on our winter sun break to on the stunning Canary Island of Fuerteventura. We stay in the beautiful resort of Costa Caleta at the All Inclusive 4★ Elba Sara Beach & Golf Resort; a firm Solos favourite! With gorgeous weather year round we are sure to find plenty of time to relax and unwind. 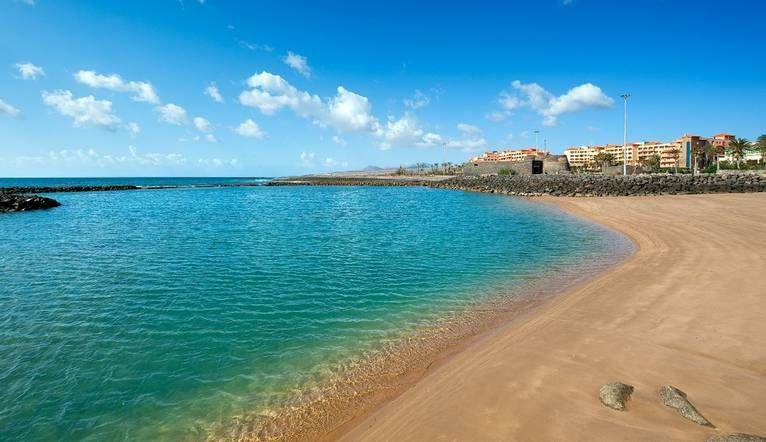 Fuerteventura is the closest Canary Island to the African coast, with only 100km separating the ‘Punta de la Entallada’ on its west coast from Cape Juby in Morocco, and is the second largest (after Tenerife) of all the islands. With 3 thousand hours of sunshine a year, the climate is very similar to Florida and Mexico which are on the same latitude, making the island a great choice for some guaranteed winter sunshine and warmer temperatures. Thought to be the oldest of all the Canary Islands, Fuerteventura’s strangely contoured landscape has evolved from various volcanic episodes. The island is renowned for its beautiful turquoise waters, as well as its numerous vast sand dunes and long, sandy beaches – considered some of the finest in Europe. We are based in the modern resort of Costa Caleta, one of the most popular on the island. This laid-back, relaxed resort is comprised mainly of low-rise, whitewashed accommodation and hotels fringing the sheltered horseshoe shaped bay of sweeping golden sands. When you are not soaking up the rays, the resort has a variety of shops, cafés and lively bars to sample. At night, the pace is low-key, perfect for a stroll after dinner in the warm evening air along the seafront to admire the picturesque 18th-century watchtower and castle overlooking the marina. If you fancy a change of scene, a short bus ride away is the island’s capital, Puerto del Rosario, a bustling traditional Canarian port, which is easily walkable, and known for its strange collection of over 100 quirky sculptures by local and international artists which are dotted around the town. If you’re feeling more adventurous, you can do a quick island hop over to neighbouring Lanzarote. I had such a great time on my first ever holiday on my own. Everything was just right from our Tour Leader to the quality of the hotel and the pleasant surprise of the friendly and interesting fellow travellers. This has opened up opportunities to travel without being dependent on friends or family to be available, have the money, want to visit the same place at the same time. This was my first time and I was very impressed. The Tour Leader was great and the group were good. The hotel was top marks and so was the food. What a wonderful memorable holiday for my first 'solo' experience and I loved it. ​The friendly hotel is the perfect spot for a relaxing holiday, enjoying an enviable location overlooking the ocean and the long sandy beach. The hotel sits in its own beautifully maintained grounds and has 2 large outdoor pools (one of which is heated in the winter) with plenty of sunbeds dotted around the spacious sun terraces. Facilities include 2 restaurants, a piano bar with regular live music and evening entertainment, fitness room, sauna, outdoor Jacuzzi, a tennis court and free Wi-Fi throughout. All the well-furnished rooms have a private balcony or terrace and sea view. Amenities include air-conditioning, satellite TV, a telephone, kettle, safe, minibar (on request) and hairdryer. The transfer from the airport to the hotel is approximately 10 minutes. These are just a few of the tours, which may be available to you depending on the time of year and the numbers interested. Full details of all the excursions available will be advised at the Information Meeting. Prices may vary, depending on numbers etc and are only a guideline. All tours should be paid for in euros or sterling only. The exact amount will be given at your Information Meeting. Your Tour Leader will help arrange these for you but may not necessarily accompany you. Your Tour Leader will be on hand to offer advice or suggestions if required but gratuities are offered entirely at the sole discretion of the individual. We suggest a group collection to cover drivers, porters and hotel staff of €15.00. Your Tour Leader will collect this on your behalf and distribute it accordingly, thus relieving you of the burden of who, when and how much to tip. The tipping of housekeeping will be left to your individual discretion (a small amount left in your room on departure should cover this and would be much appreciated). As is customary, ‘the hat’ will be passed around for the driver and guide on all optional excursions. For any meals that are not included in your itinerary, or taxi fares, your Tour Leader can advise of an appropriate percentage to add on. Medium weights for Winter. Casual “layers” for the autumn and spring months and a warm jacket is recommended for the cool mornings and evenings. Comfortable shoes are a “must” for sightseeing. The hotel prefers reasonably smart dress for dinner – gentlemen are asked to wear long trousers and a formal shirt.